So it was perhaps a slightly smelly crowd that assembled at his house in the countryside, a house he shares with a girlfriend and two small boys. Every other Dutch friend that he has here came too, along with their children; some neighbors also showed up, and several people from work, with a final estimated attendance of 25-30 adults and maybe 8 kids under the age of 6. The weather has been fine, and almost hot, and we picnicked on cold vegetable soup (which in other circumstances might have been called gazpacho, but all things Spanish were forbidden) and various spreads and nibbles and hot dogs from the grill. 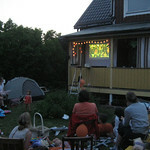 Kickoff for the game was at 8.30, by which time the sun had sunk far enough behind their house that we could sit in the front year, and see the game projected onto a sheet that was stretched out on the porch. The first half was not too exciting, with both teams playing carefully. The second half started on a more interesting note, as the two Dutch women seated beside me, tending 5 children between them, started humming and then singing a beautiful but sad-sounding tune. "What's that?" I asked. "Oh, just some songs from the 80 Years War," they said casually. 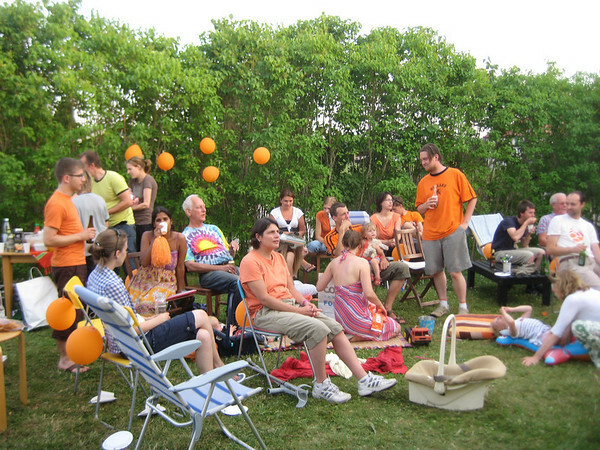 There were a few moments when it seemed like the Dutch might score; being that we were outside, and most people with a few beers in their bellies, each close play was greeted with shrieks or cheers, and I think I may have learned a lot of swear words in Dutch. 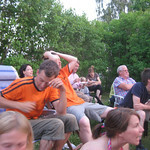 Extra time was played; a Dutch player was sent off in the dying minutes to howls of protest from the party. The Spanish scored, of course, right at the end; everyone was completely silent for a few moments. The game ended. The was not much post-game lingering; it was, after all, after 11pm by this time. As we were leaving, most everyone sought out our host E., offering their condolences. One fellow, though, tried reassure E. that it was okay, because "they had a great run anyway, didn't they?" This last was met with silence and a rather frosty look. Well, the party was fun, even if the game was not particularly. E. and his family will be finding bits of orange balloons and other decorations in their yard for quite a while, I think. And my orange t-shirt is quite happy to be sitting in the laundry at last.